Add a touch of sophisticated glamour to your look with this pretty friendship bracelet from Buckley London. 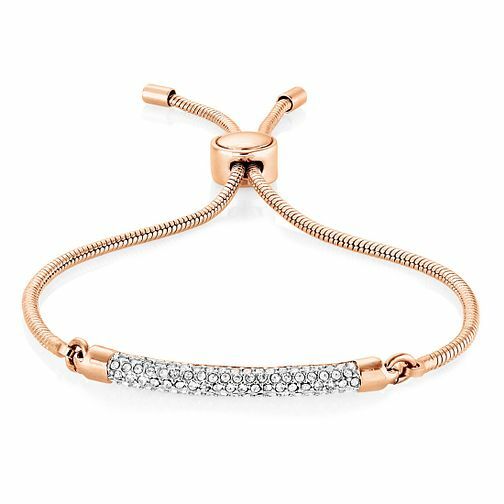 This bracelet is plated with rose gold and features a chunky row of shimmering crystals, and is finished with an elegant adjustable clasp. Buckley London Rose Gold-Plated Crystal Adjustable Bracelet is rated 5.0 out of 5 by 4. Rated 5 out of 5 by Anonymous from Beautiful Bracelet Brought this as a gift online and when it arrived it looked even better than on the website. It’s a great piece that will go with anything! Rated 5 out of 5 by Anonymous from Super bracelet Lovely delicate bracelet,looks more expensive than it actually is.Fantastic for the price.